I am speaking at a really cool conference next month on 2nd November, so I would like to share with you why it is well worth attending. 1. It is free. Yes, totally free for you to attend. It is being sponsored by Google and several other companies. 2. It has a great line-up of speakers. There will be people from as far afield as America, representing companies such as Intel, Google, MongoDB (and of course IDRsolutions). There are 3 different speaker tracks and a code hackathon running during the day. 3. It is in Istanbul. This fabulous city is traditionally where EAST meets WEST. It has an amazing history and culture, sea and sunshine. It is also a vibrant modern city with a big high tech sector. As you can see from my picture at the top of the article it is literally at the end of the rainbow! Make sure you arrive a day early so that you can see Hagia Sophia (the greatest church in Mediaeval Europe where Emperors were crowned), the Topaki Palace (home of the Sultan where the Spoonmaker’s diamond makes all the other jewels look like bits of coloured glass), haggle in the bazaar, visit the Blue Mosque… It will be a very busy day! I will be doing a talk entitled “Lessons learned from working with HTML5,GlassFish and NetBeans”. I will be sharing some of the things we have learnt over the last 3 years from creating our PDF to HTML5/SVG converter and will be there all day to chat about all things web and development related. I hope to see you there…. Details are on the Devfest website. 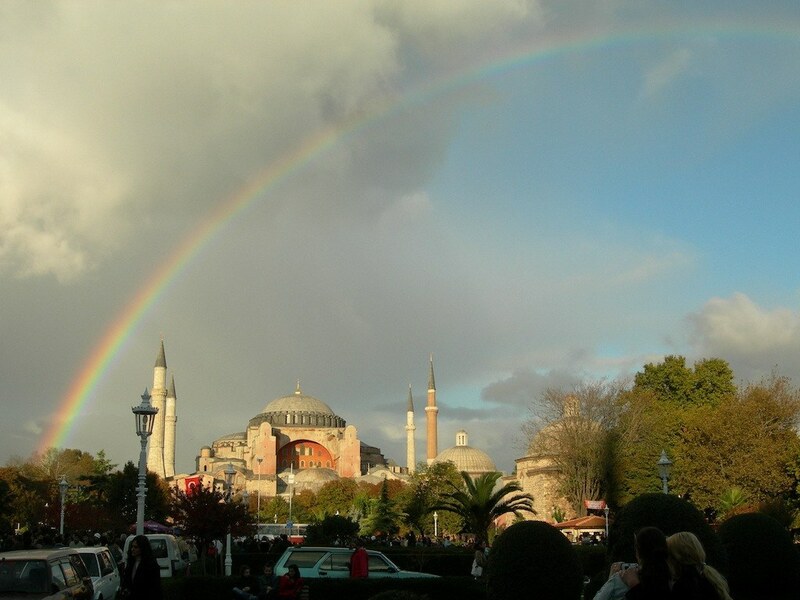 Turkey is wonderful – especially in that time of year! I was actually in Istanbul back in December. Now about the developer conference, it seems that most of the speakers are Turkish. Will the conference be mainly in Turkish or in English? I will be speaking in English. If you are thinking of going, they are on twitter at #devfestistanbul so might be worth asking.